Svensson is the pioneer and world leader in climate control and energy efficiency through textile-based solutions. With the help of wireless sensors in even the most remote locations, Ludvig Svensson is able to collect real-time and historical data on greenhouse conditions. 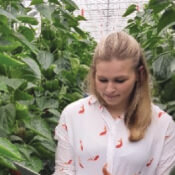 These data insights help the company improve their products on a continuous basis, facilitating optimal conditions to improve production in greenhouses all over the world.